When we fast in Ramadan, we inevitably think of those who feel hunger every day of the year. Can you imagine if no food was available at sunset? Millions of people face this crisis—their hunger doesn’t end at sunset. We know the grim statistics: 850 million people in the world are undernourished (that’s one in every six human beings), 5.6 million children under the age of five die from hunger–related illness each year. Yet, our world produces enough food to feed twice the global population. “If anyone fulfills his brother’s needs, Allah will fulfill his needs; if one relieves a Muslim of his troubles, Allah will relieve his troubles on the Day of Resurrection’’ [Bukhari and Muslim]. Livestock consumes 80% of the grain the United States produces. In Mexico, where poverty and hunger are abundant, 45% of the nation’s grain is fed to livestock. In most industrial nations, corporations raise animals in factory farms that consume huge quantities of grain, water, hormones and electricity, and produce tonnes of toxic wastes. A diet high in grain-fed meat consumes two to four times more land than a vegetarian diet. 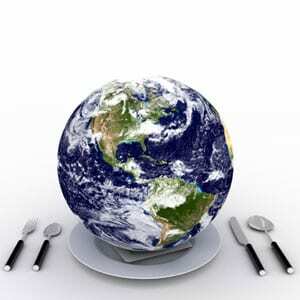 If everyone ate meat at the North American rate, the world would run out of farmland and food! Try to reduce your share of the world’s food and energy by eating more fruits and vegetables and less meat. The farther food travels before it reaches your plate, the less money the rural farmer retains. When you purchase coffee grown in Uganda, for example, 10% of the profit goes to the farmer and 90% is consumed by giant North American corporations that import and process the coffee. The farther food travels, the more energy it consumes for pesticides, preservatives, ripening, packaging, processing, transportation and sales. The food processing industry in the United States consumes ten calories of fossil fuel energy for every calorie of food energy it produces. In North America, we like to eat all our fruits and vegetables in winter. To meet this demand, governments of developing countries subsidize and encourage farmers to plant one-crop monocultures for export. This leaves small farmers unable to grow food for their families and communities. With one crop to rely on, farmers in the developing world become vulnerable when market prices fall or a disease hits their crop. Monocultures need high inputs of hazardous pesticides that threaten the health of farmers and their environment. This winter, forget the guavas and mangoes. Find the local farmer’s market and buy what’s in season. When you buy local, you avoid an unjust food trade system that keeps the poor hungry. Conventional farming, especially monocultures, requires high inputs of pesticides, fertilizers and irrigation that eventually degrade soils. 30 million hectares from the world’s 240 million irrigated hectares are severely damaged by salt build-up. Almost a third of the world’s cropland is abandoned due to soil erosion. A lack of land forces many farmers to clear and destroy forest land that cannot sustain agriculture. Pesticides and fertilizers trap farmers in a cycle of spending more and more on chemical inputs as insects become immune and the land loses its fertility. Eventually small farmers in developing countries fall into debt or degrade their land and are forced into poverty. Organic farming uses natural methods to protect the quality of agricultural land and soil and ensure that the land can continue to produce food. Organic agriculture may be the best way to ensure a continuous world food supply and protect the health of farmers and consumers. Each organic product you buy supports farmers who care about hunger and the environment. Fair trade eliminates injustices in the trade system and guarantees farmers a minimum price for their crop, enough to sustain their families. Fair trade shortens the market chain for products, allowing the farmer to receive a higher proportion of the profits. Fair trade standards require the farmer to follow environmentally and socially ethical agricultural practices. A portion of the profit from fair trade products funds social development projects in the farmer’s community. Currently, fair trade coffee, tea, chocolate, fruit, rice, and spices are available in North America. The next time you go to a grocery store, look for the fair trade logo. Every fair trade purchase prevents hunger in a poor farming community. Genetically modified crops are “owned” by corporations that have a monopoly on the seeds. Farmers cannot save the seeds for re-planting. They must purchase new seeds from the company each year and must succumb to the corporation’s regulations and prices. As more and more crops become genetically modified, our food becomes a ‘product’ rather than a renewable resource. GM crops pose health risks because they are not tested for environmental and health effects and are not subject to government safety regulations. Do your best to avoid GM products to prevent our food from becoming a corporate commodity, controlled by a few large companies. “No man fills a container worse than his stomach. A few morsels that keep his back upright are sufficient for him. If he has to, then he should keep one-third for food, one-third for drink and one-third for his breathing” [At-Tirmidhi]. Help end hunger with a commitment to buy less, eat less and waste less food. Food aid from rich nations does not help hunger. Rich nations often dump surplus grain on poor nations, as “food aid”. This “aid” rises and falls to maintain the market price of commodities in rich countries. Food dumping reduces the price of farmers’ crops in developing nations. Farmers cannot sell their produce and earn enough to invest in future crops. Poor farmers need long-term solutions. They need investments and interest-free loans to buy land or equipment so they can diversify their crops and survive times of drought or falling prices. When you send Zakat overseas, choose a charity that helps people become independent, rather than dependent on aid. Debt repayments to rich countries prevent poor countries from spending on poverty, hunger and welfare of their citizens. Start a family letter-writing campaign to eliminate debt and hunger. “If any Muslim feeds a Muslim when he is hungry, Allah will feed him with some of the fruits of Paradise” [Sunan Abi Dawud].